I’m not a great believer in new year resolutions but a bucket list well that’s another matter! Here is a list of some of the things I am “planning” for 2018. I’m not too clever on timing – The Pyrenees adventure appeared on my horizon in 2014 and I did it in 2016, the run across Italy 2015/16 and I did it on 2017. But who knows what the future has in store, that’s what makes it so exciting. 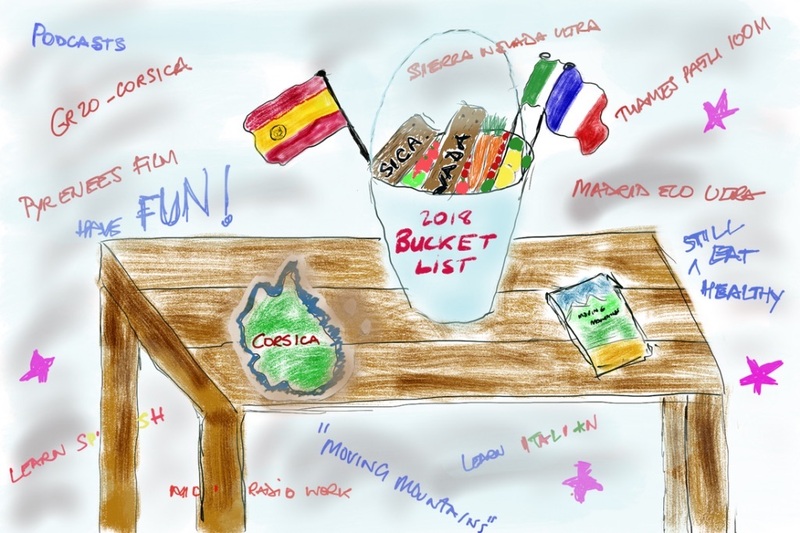 Run across Corsica – GR20 – this will be my trans country trip for 2018. Was hoping for something more ambitious but the pesky book is taking up a lot of time and I really want to finish it. And of course Kilian Jornet did this one a few years ago although I’m not planning to emulate the 32 hours he took to complete it. It took me 3 time longer than him to cross the Pyrenees so on that basis I think 100 hours “run time” would be very acceptable. Also as I would be going solo as usual (unless the might of the Solomon Team want to get behind me) I will be stopping for overnights. Pyrenees Film – Yes I know I haven’t finished the book yet but I’m really keen to retrace this epic journey and make a short documentary to inspire others. I need to get $10,000 to get the project off the ground. So come on Sky, Channel 4 – forget the crappy “reality” programmes and get involved with a proper, real good news story. Media Work – I had such fun on BBC Radio 4 and Radio Berks and I loved my Podcast with Todd Nevins so here’s hoping I can do a bit more in 2018. If not I’m still planning to do my talks anyway – I’m not comfortable speaking in public but it’s not a bad thing to get out of your comfort zone on a pretty regular basis! Learn Italian or Spanish (or both!) – We Brits are pretty shameful when it comes to speaking other languages. I do speak French and a smattering of Polish and Swahili but I would love to learn a “Mediterranean” language properly. I got an Ap on my phone which reliably informed me that, after persevering for 3 months, I knew 3% of the Spanish language so this might appear on the next bucket list as well. More Ultras – I’m not a huge fan of the organised races – they are so expensive in the UK, but I’m on the waiting list for my old favourite the TP100 (who knows I might even finish it one day) and I’m planning on doing the Sierra Nevada Ultra as my real challenge in July. ”Moving Mountains” – The book WILL be finished. I’ve read the chapters I’ve done so far and I tell you what …… it’s a good story – a bit unbelievable – but a good story nevertheless! But above all I’m wishing for health and happiness and I’m wishing the same for all of you out there too. I never forget how lucky I am to be able to dream and do all this stuff. Anyway let me know what your bucket list is in the comments section below and whip knows maybe we can inspire each other!